As a candle lover, Jennifer burns candles every day. She found herself disappointed by the toxic black soot that lined the jar of every candle she purchased at chain retailers. As a mother and grandmother, she didn’t want these toxins in her home. So three years ago, she started making her own natural soy-based candles. And what started out as a hobby has since turned into a local small business! Every weekend, she travels to farmers’ markets and craft fairs all across the Hudson Valley and the Capital Region sharing her passion for amazing smelling, clean-burning candles. Whether you’re looking for weddings favors, party or shower favors, wax melts, unity candles or any special and unique gift, Firefly has a custom candle for you! Please feel free to message her with any questions about custom orders (scent, candle style, etc.) or to discuss the candle making process and benefits of soy wax. Marysa is an artist by nature. She creates primarily wearable artwork. Her metalwork accentuates the beauty and richness found in the world around us. Using recycled metals and elements such as wood, stone, and botanicals, she strives to express her reverence for the wonders of nature through her work. Dana Antonia makes minimal sterling silver jewelry that embraces the individuality of each piece. All of her work is handmade with love in her home studio in the Hudson Valley. Her designs are drawn from her history as a two-dimensional artist - in drawing, painting, and photography - as well as from her own personal style, creating pieces that are versatile and effortless. She is intrigued by the expressive irregularity of handmade objects: even when produced repetitively, no two will ever be exactly the same. Instead of trying to remove every trace of the human hand, she works to celebrate the "wiggle" of her pieces and many play on asymmetry as well. She is having so much fun with her studio practice and nothing makes her happier than being able to see someone else wearing and loving her work. Helen’s Royal Tea House is a place where you can find an eclectic blend of vintage china and beautiful potteries from around the world. Helen creates China Cake Tiers for all sorts of events. From Weddings/Bridal Showers to Entertaining and Home Decor. Each cake tier is unique and will look stunning gracing your table at any occasion.Her cake tier/tid bit stands/ jewelry displays are unique, dazzling, functional and can easily come apart to store away in a drawer or cabinet. Renee Ludwiczak is the proud daughter of well-regarded sculptor, Theodore Ludwiczak. Ted lived in Haverstraw, NY, where he developed his sculpting gift after retiring from his career as an optician. When he passed in 2016, it was Renee's desire to create a means of honoring him, his work, and his continuing legacy. 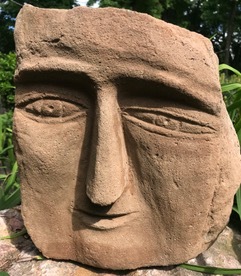 The popularity of his sculpted stone heads has created an overwhelming demand for his work. Not wanting to part with the original pieces, Renee is pleased to announce the birthing of “2nd GENERATION TED’S HEADS”. The identical, limited numbered replicas are molded directly from the originals and cast using GFRC (glass fiber reinforced cement), giving them an authentic feel and quality. Michele Therese, a native of the Hudson Valley creates unique, handmade wearable art. Each piece can be worn dressed up or dressed down. She is inspired by art, color theory and the healing aspects of nature. She recognizes the need for affordable, unique pieces that radiate positive “vibes.” Each piece is designed to have a clean, timeless look, as well as healing energy. Michele believes in giving back. She donates a portion of her sales to the Lupus Research Alliance. While recovering from surgery, Donna decided to try crocheting, after her mother in law showed her how to do a single loop 20 yrs ago, before she passed. Donna then said to her daughter, "I don't know what this is, but I'm just crocheting". Her daughter replied, "that looks like a poncho". Donna completed 4 ponchos in lemon/lime, peaches n' cream, strawberry pink and cotton candy blue, which her daughter then wore to church. The women from church were taken aback by the ponchos, resulting in an invitation to feature them in an upcoming fashion show. She prepared 9 ponchos in 2 wks, which ultimately became the Grand Finale of the show. Since then Donna has sold her ponchos at festivals, and craft shows for the past 10 years, selling out and creating new items for every show year-after-year. Donna doesn't use any patterns, but crochets using her unique style, use of different textures, and vibrant colors, which have helped her create her one-of-a-kind pieces. Her newest designs include hoods, which have also been added to her shawls. A resident of Westchester County, Sally Mennella is an avid sewist, who sews under the direct supervision of her constant companion, Cersei the cat. Her creations can be viewed on her Etsy shops. Cheyenne Mallo is a potter, hiker, and lover of maps. Her pottery utilizes topographic map imagery to capture the sense of playfulness and adventure that she has discovered during her hiking explorations. These pots can provide users with a daily reminder of past adventures, or function as an inspiration to explore new trails. Robin Larido is a fiber artist and jewelry designer originally from Brooklyn. Robin earned her degree in Fine Arts from Brooklyn College. She currently resides in Croton-on-Hudson with her husband and daughter. Her artistic style can be described as “Shabby Chic Eclectic” incorporating color palettes and elements from Victorian, Art Nouveau and Japanese decorative arts. Common design themes include floral motifs and butterflies. She has moved from creating large quilts, decorative pillows and wall hangings to her current focus of fabric and textile accessories and jewelry. Raw-edge and three-dimensional applique and hand-stitching add surface texture and visual interest to her creations. 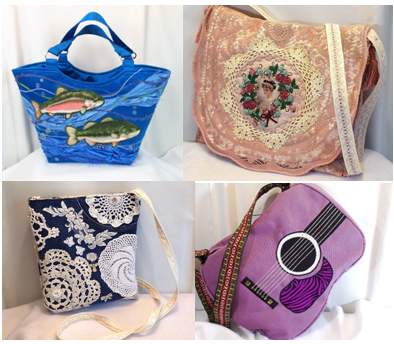 Robin’s work has been published in “Somerset Studio Gallery”, “Sew Somerset” and “Jewelry Affaire” magazines. Robin credits her mother and grandmother for nurturing her creative spark, talent and love of sewing. Nora Freeman has always been intrigued by attractive jewelry, but only began to make it for herself a few years ago, after her mother’s death. Her mother also loved beautiful jewelry and had an eye for anything that was distinctive and striking. It felt like a way to connect with her after her death. Nora designs and produces necklaces, bracelets, and earrings. Each piece is handmade and one of a kind. Using a variety of beads including semi-precious gemstones, freshwater and faux pearls, crystals, shell, ceramic, glass, metal, wood, seeds, bone, and horn, she strives for harmony of colors, sizes, shapes, textures, and lusters. The findings are hypoallergenic. Najm Duran was born in Brooklyn and now resides in Warwick, NY with her husband and 4 children. Although she has always been interested in natural body and skincare products, it wasn’t until her daughter suffered with bad acne after her first year in college that she decided to create her own line of natural skincare products. After starting the company with just sugar scrubs, the brand quickly expanded online, now offering 20 different products. She offers products that can be used from head to toe. Some of her products include deodorant, face wash, soaps, hand and foot scrubs and body butter. With over 20 products, there’s a product for everyone. Brian Conklin and Christine Gunning are the Co-Owners and designers of Royally Beaded, Royally Beaded specializes in hand made glass beaded jewelry which include: memory wire bracelets, earrings, necklaces, wine glass markers, and lapel pins. Royally Beaded also specializes in jewelry repair and custom orders. Both Brian and Christine have lived in Rockland County all their lives. Who doesn’t want to be pampered and given the royally treatment? With Royally Beaded you can’t go wrong. If you want to check out all of our merchandise check us out on Facebook @Royally Beaded or on Instagram @Royally Beaded. Cindy Riedi is the owner & designer of Riedi's Handcrafted. She produces only high-quality items made in NY State. She first tried her hand at jewelry making in the late 1970's, but stopped for 2 decades while doing the wife and mother routine. She started to create again in 2004, and has continued ever since. All her jewelry & wood items are individually designed & handcrafted in Sherburne, NY. Her husband, Mickey, also has his hand in their business. He uses local wood to create artwork in the form of food safe bowls, platters, chalices, goblets, and mugs. Richard Logue, proprietor of Beads-n-Creases divides his time between working at a local craft store and creating jewelry as well as ornamental crafts combining the ancient art of origami with contemporary beading. Visit Beads-n-Creases Facebook page for more info. Tunde Szolga always been interested in creativity. She had tried lot of things, but jewelry-making became her love. It started when she received a beautiful beaded necklace as a present from her sister couple years ago. She loved it so much she wanted to create one on her own. She purchased different kinds of beads and crystals and created her first piece of beaded jewelry. She likes learning new techniques and experimenting with new materials. Her inspiration mostly comes from nature nad the materials she mostly uses are glass beads, Swarovski crystals and mineral stones. Visit her Facebook and Etsy page. Karyn, founder and sole proprietor of Twisted Creativity, endeavors to capture each moment with her own proverbial flavor of Twisted Creativity. Retail manager by day, adjunct professor by night, Karyn currently resides in Rockland County, NY, where her back yard and/or living room closet serve as her studio in her non-existent free time. Karyn’s current passion lies in incorporating her own torch-fired glass beads into her chainmaille jewelry. Her jewelry designs include Celtic, modern, LGBTQ pride, SteamPunk and everything in-between. Follow Twisted Creativity on Facebook for the latest products and special discounts! Follow Twisted Creativity on Instagram for real-time creative exploits. Lisa originates from Brooklyn where she received a BA in Cultural Anthropology. Her designs feature organic flowing forms and are inspired by her travels and influenced by other cultures. Her pieces are made of sterling silver, bronze, brass or 14 K vermeil and semi-precious stones united in harmonious combinations that reflect natural environments. Pieces can also be custom ordered in gold. She has been making handcrafted jewelry at home since 2012. She recently opened an Etsy shop to sell her sea glass creations. Her sea glass jewelry is made with glass that her family and she have hand picked from the Hudson River shores of North Rockland and Clarkstown. These areas include Stony Point, Emeline Park in Haverstraw, NY and Rockland Lake State Park. She uses a variety of materials including sterling silver, stainless steel, copper, aluminum, organza, suede and many more to embellish the sea glass and make a truly unique piece of jewelry. Enjoy tasty, eclectic delights created by our restaurants as you stroll down the park. Visit a variety of the local food vendors to satisfy your cravings as you join in the fun. Don Coqui On The Hudson is the premier destination for purely authentic Puerto Rican cuisine. Located directly on the Hudson River in Emeline Park, Rockland County. The shortcut to Puerto Rico has arrived in Haverstraw, NY bringing its great tasting recipes and the best live entertainment our culture has to offer. Puerto Rican American/fusion straight from the Village of Haverstraw. 5Senses opened for business in 2015 and has garnered a big following. They cater and are available for private parties. Follow them on Facebook. Authentic Mexican Food influenced by central Mexican Cuisine. Follow them on Facebook. Lauren Leibowitz is the owner and creative director of Laur’s cake pops. She has a design background and a true love for the creative world. She creates delicious and unique treats from cake pops, cupcakes, cookies, and much more. Her passion shows through her presentation of her work and the decadent taste of her creations. The Village of Haverstraw's favorite iceman 'Champagne' will be at the festival serving the best home made flavored ices in the state of New York.